Racial profiling is described as the use of an individual's ethnic appearance or physical characteristics to decide whether to engage in law enforcement exercises. This lesson looks at four texts, all related to racial profiling. The texts are all very different in nature because they target different audiences. Comparing and contrasting the different texts will help us understand how audience and purpose affect the structure and content of texts, which is the first learning outcome for Part 1. Below are four texts, all of which relate to the topic of racial profiling. Have a discussion on the different nature of the texts as you fill in the table below. Here are definitions of four concepts to apply to these four texts. Text type is a term used to describe the nature of the text, where its found and what kind of structural conventions it uses. See also the glossary definition of 'textuality' and the section of this Subject Site on text types. Audience refers to the people targeted by the text. What can be said about the demographic group that reads texts like the ones you are studying? Message refers to the main idea that the author is trying to convey. What is the basic understanding that the audience is meant to come away with? Purpose is often closely related to message. Why is the writer writing this message? In your answer to this question, go beyond superficial responses that only mention the purpose to entertain, persuade or inform. The title says it all: Police officers must not discriminate. To define the law and clarify the government's position on racial profiling. Any person, African American or Hispanic, who feels like a victim of racial profiling. The main idea is that racial profiling is common but not legal. To help victims understand their rights, advise minorities on how to handle situations. The message is that racial profiling happens, and you should know how to deal with it in a smart and effective way. To spread awareness about a problem in America, to inform and advise minorities on their rights, to raise support for the ACLU. A public service announcement, that takes the shape of a 'wanted' poster. Americans in general, both African American and white. Readers of the New Yorker (where this appeared), a magazine that targets a higher-educated audience. You cannot judge a persone by his or her color of skin. Unfortunately it happens regularly and action can be taken to prevent it. To raise awareness about a common problem, to support the ACLU. Use the four texts below to fill in the chart above. Federal law enforcement agencies and officers sometimes engage in law enforcement activities, such as traffic and foot patrols, that generally do not involve either the ongoing investigation of specific criminal activities or the prevention of catastrophic events or harm to the national security. Rather, their activities are typified by spontaneous action in response to the activities of individuals whom they happen to encounter in the course of their patrols and about whom they have no information other than their observations. These general enforcement responsibilities should be carried out without any consideration of race or ethnicity. Example: While parked by the side of the highway, a federal officer notices that nearly all vehicles on the road are exceeding the posted speed limit. Although each such vehicle is committing an infraction that would legally justify a stop, the officer may not use race or ethnicity as a factor in deciding which motorists to pull over. Likewise, the officer may not use race or ethnicity in deciding which detained motorists to ask to consent to a search of their vehicles. The most common example of police racial profiling is "DWB", otherwise known as "driving while black". This refers to the practice of police targeting African Americans for traffic stops because they believe that African Americans are more likely to be engaged in criminal activity. While racial profiling is illegal, a 1996 Supreme Court decision allows police to stop motorists and search their vehicles if they believe trafficking illegal drugs or weapons. More traffic stops leads to more arrests, which further skews the racial profiling statistics against African Americans. Studies have shown that African Americans are far more likely to be stopped and searched. Are African Americans really committing more crimes or are they just caught more often because the police target them? This is a vicious cycle that even the strictest law enforcement advocates would admit is patently unfair. What can you do if you are stopped? Know your rights: you are not required to give permission to police officer to search your car. You can deny the request - but do so politely. Don't argue: the police may try to intimidate you. Do not be confrontational and provoke an argument. Get the names of the officers: be sure to get their badge numbers, squad car number, license plate number, and make a note of the location and time of day. File a complaint if you feel you have been mis-treated: contact the ACLU or other civil rights organizations for legal advice. To further your understanding of the texts, you can base a discussion on the following questions. Which two texts are the most similar? Why do you think this? Which texts were the most difficult to understand? How did your understanding of the text depend on the context of the text? In Text 4 you see two faces. The face on the left is Martin Luther King, civil rights activist. The man on the right is Charles Manson, serial killer. Knowing this, how does your understanding of the text change? Written task 1 - After reading one of the texts, you can write a letter to its author. You can write a letter to the US Department of Justice, commending them for their efforts to prevent racial profiling. You can write a letter to Elon White, commenting on his use of humor to inform his audience. 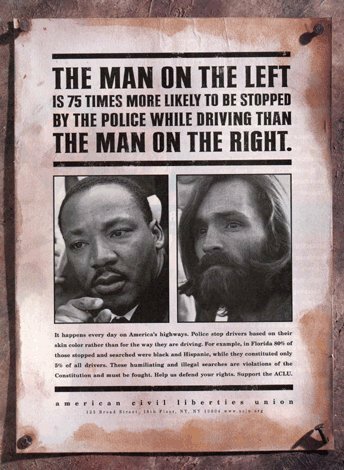 You could write a letter to the American Civil Liberties Union, responding to their ad campaign on racial profiling. "How does the text conform to, or deviate from, the conventions of a particular genre, and for what purpose?" "How has the text borrowed from other texts, and with what effects?" Answers to these questions could include comments on the use of the 'wanted poster' text type, the choice of image and the language of the copy. A sample response to one of these questions has been provided in the written task 2 samples section of the Subject Site.